Before we discuss Compression Stockings, its worth understanding what Varicose Veins are, and how compression stockings can help with them. The term commonly refers to the veins on the leg. Although the varicose veins can occur anywhere else. The most common place for it to occur is in the leg. Veins typically have leaflet valves to prevent blood flowing backwards medically known as retrograde flow or venous reflux. The muscles in your leg pump the veins to return blood to the heart against the effects of gravity. However, when a vein becomes varicose the leaflets of the valve no longer operate efficiently. Therefore allowing the blood to flow backwards which cause varicose veins. Besides being a cosmetic problem, varicose veins can be painful, especially when standing. Compression socks and stockings is an alternative technique used to prevent varicose veins from developing or help reduce swelling and the possibility of blood clots. However, compression stockings can also function as a great supportive mechanism for a healthy blood flow and keep bothersome symptoms at bay, especially when worn on a long-term basis. Preventing blood clots, primarily after surgery or injury when you are less. Varicose veins is a growing concern. It has been reported that about 40 percent of the US population may be affected by chronic venous insufficiency. The same chronic venous insufficiency that can lead to more serious issues, including varicose veins. People that experience you chronic venous insufficiency, typically experience heavy legs and swollen ankles at the end of the day. You may also experience pain or night cramps in your legs. The pressure that these stockings put on your ankles and legs compresses the surface arteries and veins, helping the vein valves to function properly allowing the blood to flow back to your heart without obstructions. Rectifying the flow of blood again. Now this may seem like a small thing however it is important to know how to use compression stockings to get the best possible outcome. It’s extremely important to put on compression stockings in the morning, before you lower your legs and get out of the bed. Sleeping in a horizontal position allows for a your vein valves to function more effectively. When you are sitting or standing, gravity compromises the blood flow. Therefore it is very important to put the compression stockings on in the morning before swelling accursed throughout the day. Putting compression stockings on in the morning will keep the valves in the right position to support healthy blood circulation in your legs throughout the day. firm and extra firm compression, which are typically recommended by a doctor in more serious cases of various venous diseases, including deep vein thrombosis, leg ulcers, and lymphatic edema. Take measurements of your legs before you get out of bed in the morning or even lower your legs. It is important to take measurements in the morning because you will get the sizing before the swelling occurs. For knee-high socks, measure the narrowest part of your ankles and the widest part of your calves. Then sit up on your bed, placing your feet on the floor and bending your knees so your legs form a 90-degree angle. Take the measurement between the bent knee of each leg and the floor. For thigh-high stockings, start the same as taking measurements for knee-high socks. Continue by standing up and measuring your thighs under your buttocks. Finally, measure the distance between your buttocks and the floor. Whilst this may not be difficult. It’s Important to maximize the use you get out of your stockings and strength optioned from the usage. Below are some tips to keep in mind to make your compression stockings last longer. Use cold or mild temperature water when washing. Hand-wash your stockings instead of using a washing machine. Don’t use fabric softener — only soap or mild detergent. Never use a dryer. Hang your stockings to dry instead. Wash the stockings each day with mild soap and water. Rinse and air dry. If you can, have two pairs. Wear one pair each day. Wash and dry the other pair. Replace your stockings every 3 to 6 months so that they maintain their support. Knee length stockings should come to 2 fingers below the knee bend. You should always discuss using compression stockings with your doctor. 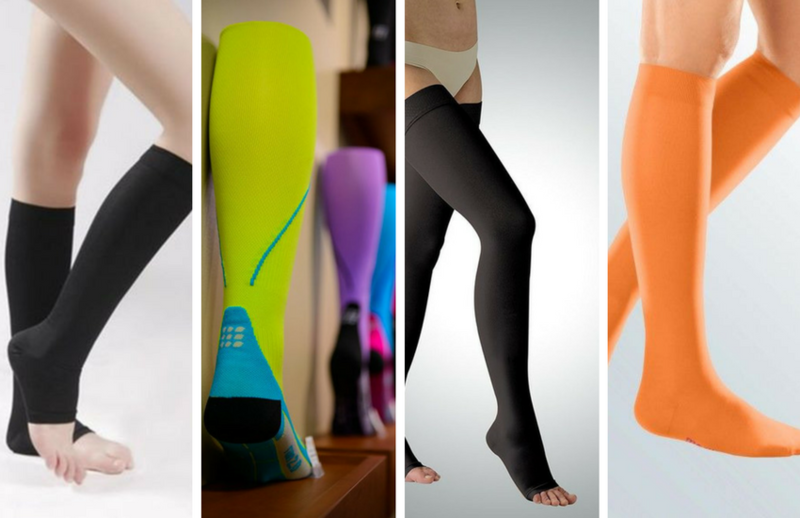 We list five of the main compression stocking suppliers, the brands and types of stockings. Its worth noting that some of them sell the same brands and its worth price checking in Amazon or Ebay. Level of compression: Mild, moderate and firm compression. Vein Solutions provide a wide variety of varicose vein treatments throughout Cheshire and North Wales. Vein Solutions provides a comprehensive range of varicose vein treatment services encompassing both minimally-invasive techniques and conventional vascular surgical procedures to eradicate varicose veins.